It affects both our physical and mental well-being –– and it starts in the gut. The central location of your microbiome is your gut, which contains trillions microbes. If you want to optimize your health, bio hack your body, prevent and heal chronic disease, and know which foods are right for you—almost all of this information can be found in your microbiome. A breakthrough company, Viome, offers technology to measure your microscopic organisms and their behavior at a molecular level. Think of it as the Instagram of your inner world—a snapshot of what’s happening inside your body. New research about the microbiome is changing the understanding of who you are as a human and how your body functions. The microbiome may be mission control for your body and mind. Your healthy microbiome is part best friend, part power converter, part engine, and part pharmacist. At Viome, we’re working to analyze these microbial functions and recommend a list of personalized food and supplements to keep these internal complex machines in a finely tuned balance. New insights emerging from microbiome research are changing the perception of what keeps you healthy and what makes you sick. This new understanding of microbiome activities may put an end to conflicting food advice and make fad diets a thing of the past. The value of your Microbiome just got an upgrade. Here are some of the amazing things we’ve learned from our work at Viome. Each week there is a new fad diet released, discussed, and followed. The newest “research” shows that this is now the superfood to eat for everyone. But, too often, the fad diet is just a regurgitation of what worked for one person and shouldn’t be followed by everyone else. For example, you’ve been told to eat your greens and that greens and nuts are anti-inflammatory, but this is not always true. Spinach, bran, rhubarb, beets, nuts, and nut butters all contain oxalate. Oxalate-containing food can be harmful, unless you have the microbes present that can metabolize it into a non-harmful substance. Our research shows that 30 percent of Viome customers do not have the microbes to metabolize oxalates properly. For these people, healthy foods like spinach are actually not healthy. 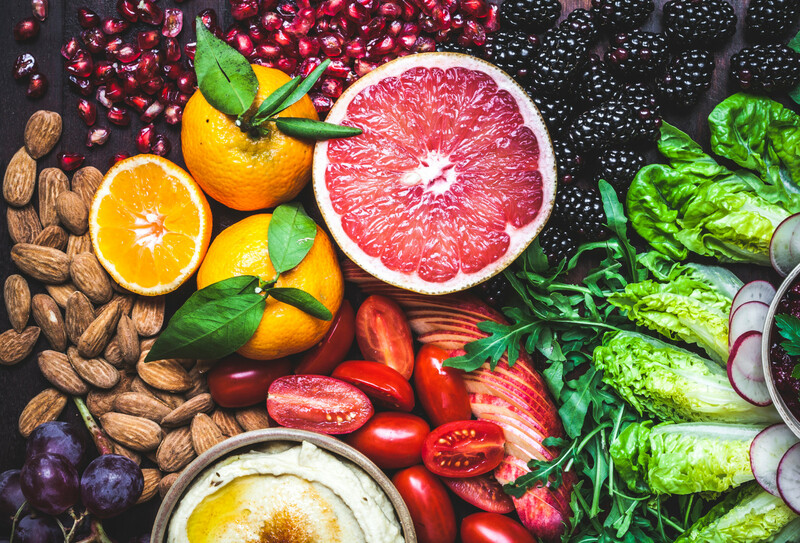 Polyphenol antioxidants in foods are usually considered very healthy, but unless you have microbes that utilize specific polyphenols, you may not get their full benefit. One example is a polyphenol called ellagic acid. Tests can detect if your microbiome is metabolizing ellagic acid and converting it into urolithin A. It is only the urolithin A that has anti-inflammatory and antioxidant effects. Without the microbes to do this conversion, you will not benefit from the ellagic acid in foods such as walnuts, raspberries, pomegranate, blackberries, pecans, and cranberries. We have analyzed tens of thousands of people, and only about 50 percent of people actually receive the anti-inflammatory and antioxidant benefits from eating foods containing ellagic acid. Protein is considered good for you. It helps build muscle and provide energy, but if you eat too much, it can cause inflammation and decrease longevity. Your microbiome can be analyzed to determine if you are eating too much protein that feeds protein-fermenting bacteria like Alistipes putredinis and Tannerella forsythia, and if these organisms are producing harmful substances such as ammonia, hydrogen sulfide, p-cresol, or putrescine. These substances can damage your gut lining and lead to health issues like leaky gut. Choline in certain foods can get converted by bacteria into a substance called trimethylamine (TMA). When TMA gets absorbed into your body and is converted to trimethylamine N-oxide (TMAO), it is associated with heart disease. However, TMA conversion doesn’t happen if you don’t have these types of bacteria in your microbiome. What foods contain choline? Liver, salmon, chickpeas, split peas, eggs, navy beans, peanuts, and many others. On the other hand, when you don’t have enough iron, you could become anemic, which leads to symptoms of weakness and shortness of breath. Your gut and brain are connected via the vagus nerve. A large majority of neurotransmitters are either produced or consumed by your microbiome. In fact, some 90 percent of all serotonin (a feel-good neurotransmitter) is produced by your gut microbiome and not by your brain. When you have a toxic microbiome that’s producing a large amount of toxins like hydrogen sulfide, the lining of your gut starts to deteriorate, resulting in what is known as” leaky gut.” Think of leaky gut as your gut not having healthy borders or boundaries. When this happens, disease can emerge. When the barrier of the gut breaks down, it starts a chain reaction causing low-grade chronic inflammation, which has been identified as a potential source of depression and higher levels of anxiety, in addition to many other chronic diseases. If you want to get the most out of your meditation and reduce your stress levels, make sure you are eating food that promotes a healthy microbiome. If you want more energy, get your microbiome into balance. No, you don’t need three pots of coffee to keep you going; you just need a balanced microbiome. Your microbiome is responsible for calorie extraction, or creating energy, through pathways such as the tricarboxylic acid cycle. Your body depends on the energy that your microbiome produces. How much energy you get from food is dependent on how efficient your microbiome is at converting the food into energy. High-performing microbiomes are excellent at converting food into energy. This is great when you are an athlete and need the extra energy, but if you don’t use up the energy, it may be the source of some of those unwanted pounds. If the microbes can’t metabolize the glucose (sugar) that you eat, it will be stored as fat. If the microbes are extracting too many calories from your food or producing lipopolysaccharides and causing metabolic endotoxemia leading to activation of toll-like receptors and insulin resistance, you may end up storing what you eat as fat. Think of your microbiome as a car from the future—it can take pretty much anything and turn it into fuel if it’s strong and resilient enough. Got joint pain? Your microbiome can tell you why. Lipopolysaccharide (LPS) is a key pro-inflammatory molecule made by some of your microbes. If your microbes are making too much LPS, it can wreak havoc on your immune system by putting it into overdrive. When your immune system goes on the warpath there is often collateral damage to your joints and other body parts. Balancing your microbiome is a better solution than reaching for the glucosamine. Think of your microbiome as the top general of your immune army. It puts your immune system through basic training and determines when it goes to war. Ideally, your immune system wins the quick battle and gets some rest, but sometimes if your microbiome keeps it on constant high alert, a long, drawn-out war begins, resulting in chronic inflammation and chronic diseases. Are you “getting older” or is your microbiome just making you “feel” older because it keeps giving warnings to your immune system ultimately leading to chronic pain? Before you throw in the towel on your favorite activities, check your microbiome. And, if you have anything with “itis” in it, it’s possible that when you balance your microbiome, the inflammation from your “itis” will be reduced. When you have low stomach acid, your mouth bacteria travels to your gastrointestinal tract. Stomach acid helps you digest your food and protects you from the bacteria in your mouth and the parasites and fungi that are in your food. If you don’t have enough stomach acid, the bacteria in your mouth will invade your gut. This invasion is associated with—and is a risk factor for—autoimmune disease and inflammation in the gut. Low stomach acid is perhaps one of the major causes of chronic disease. What kinds of things cause low stomach acid? Stress and antacids. Rejoice! Perhaps carbs aren’t as bad as you thought (as long as your microbiome is up to the task). You can see if some of the starches you eat can be made into amino acids by the microbiome. Your microbiome makes 20 percent of your branched-chain amino acids (BCAAs), and it will adapt to make these vital BCAAs for you in almost any way it can. Essentially, your microbiome is hooking up carbons and hydrogens into different formulations of BCAAs, depending on what you feed it. The microbiome is excellent at adapting and pivoting based on the food you feed it and the environment that it’s in. So, good news: Carbs are protein precursors, as long as you have the right microbiome. Your microbiome is a world-class entrepreneur that can take low-grade sources of food and turn them into valuable and useable energy. This entrepreneur is within you, working wonders to make sure you have energy and that all of your needs are met. Just like a best friend, if you take great care of your microbiome, it will take great care of you. Given the research emerging daily about the microbiome and its importance on your quality of life, prioritizing the health of your microbiome is essential. When you have a healthy microbiome, you are much more likely to have a healthy life. It’s now clear that some of the greatest insights for your health will come from your Microbiome and Viome is the best choice for getting this insight. Your life may depend on it.